At Graphskill we are a cerebral lot, and love nothing better than a game of chess to keep the mind sharp. Our old plastic “travel” set was getting a bit tired, so Martin thought of a great idea. Use some of our stainless steel components as the pieces, and it looks fabulous. We think this could be a runner and are considering marketing some boards – what do you think? 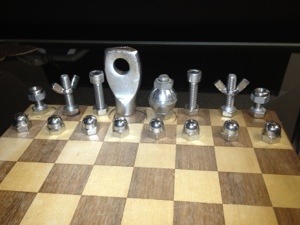 Would you buy a stainless steel chess set for the coffee table?